The prospect of having surgery performed on your beloved pet is an understandably worrying one for any owner -- and sometimes a puzzling one as well. Your veterinarian at Oakland Park Animal Hospital, Dr. Spencer Ratnoff or Dr. Gary Glickman, will put you at ease and answer your questions personally. In the meantime, here are some answers to frequently asked questions about veterinary surgery. What kinds of veterinary surgery do you perform? Our Oakland Park veterinary team can perform a wide range of veterinary surgical procedures, ranging from skin tumor removal and spay/neuter surgery to critical emergency operations that may save your pet's life. Why is spay and neuter surgery important? We recommend spay and neuter surgery as an important wellness procedure because it can remove the risk of several types of reproductive cancer. It also lowers female animals' risk of breast cancer. Do you do dental surgery? Sometimes a damaged or infected tooth needs to be extracted in order to relieve pain and reduce the disease threat to other oral structures. We can perform such extractions if necessary. Can you surgically repair injured or diseased joints? Your veterinarian at Oakland Park Animal Hospital can perform many types of orthopedic surgery to restore pain-free function in damaged knees, dysplasia-afflicted hips and other orthopedic issues. What emergencies might call for surgical intervention? Ingested foreign objects, internal bleeding, urinary system blockages and GDV (a twisting of the digestive organs also known as "bloat") are examples of situations calling for immediate pet surgery. Broken bones may also require surgical stabilization with screws or plates. What if my pet needs emergency surgery in the middle of the night? We understand that veterinary emergencies happen 24 hours a day. That's why we transform from an animal hospital during the day to an animal emergency trauma center at night. Your pet can therefore receive emergency surgery 24 hours a day, 7 days a week. My pet has a skin tumor. Does this require surgery? We routinely remove a skin mass for biopsy. If the biopsy shows no malignancy, then your pet won't require additional surgery. If a malignancy exists, we may excise more tissue to make sure the cancer is completely removed. We advise pet owners to withhold food and water 12 hours before surgery; this helps to prevent regurgitation under anesthesia. Try to limit stress and exertion in your pet on the morning of the procedure. How do I help my pet recover from surgery? Your veterinarian will prescribe antibiotics, painkillers or other medicines as needed, advise you on how to check the wound for signs of infection, and then schedule a follow-up examination. 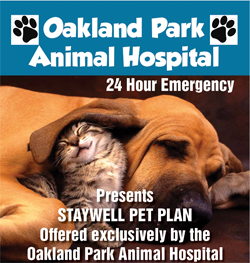 Call (954) 731-4228 with any further questions you may have about pet surgery in Oakland Park. 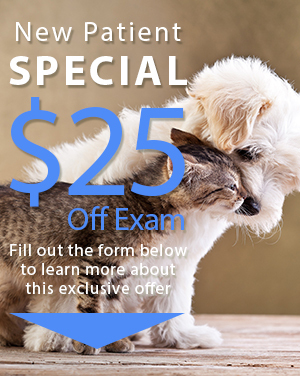 We can help you make informed decisions and schedule the care your pet needs!